The much anticipated Flashbang Bra Holsters are here. then you can email us 2ndammendmentstuff@gmail.com, or call us (937) 698-9324. Then contact us to place your order. If you wand to carry concealed, but don’t want to wear a belt holster, this is the holster for you. The “Superthumb” Magazine Speed Loaders are In. Earlier this month we negotiated a deal with the manufacturers of the “Sperthumb” pistol magazine speed loaders. They arrived today. We have not hadt time to load the information on our web store, and probably will not be able to do that for a couple weeks. But you you want some, you can contact us, and we will be glad to email you a paypal invoice, and then them out to you right away. The cost is $7.95 ea. They come in 9 sizes, and work for most all Pistol Magazines. IMI BABY EAGLE, 9MM OR 40 CAL. CZ75, 9MM OR 40 CAL. KELTEK, 9MM OR 40 CAL. WALTHER P99, 9MM OR 40 CAL. S&W 99, 9MM OR 40 CAL. SPRINGFIELD XD, 9MM OR 40 CAL. ALL 1911 STYLE, IN EVERY CAL. SIG SAUER 220 IN EVERY CAL. GLOCK 9MM OR 40 CAL. BERETTA 9000 9MM OR 40 CAL. Ye The Flashbang Holsters are coming. We will be carrying the Awesome Flashbang holsters very soon. We Make our own line of Leather Holsters,Hybrid holsters, And Kydex holsters for Competition shooters. We make Kydex reinforced belts, we make Double layer, and single layer leather belts. But when we see something like these Awesome Flashbang Holsters, We just have to have them too. Whe met with The Loopers at the 2013 SHOT Show. We saw all of their awesome products for women, and made the decision that these would be a great addition to our line of products for women. They have started production on our order, and we should have them in 2-4 weeks. As soon as we have them in stock we will add a Link. Util then, If you would like to order one contact us at 2ndammendmentstuff@gmail.com. or just check at www.2ndamendmentstuff.com They will be there soon. Below is a list of the firearms they will be available for: Cost will be $39.95ea. Listed below please find the Class dates for Firearms training. We have 2 formats for this class. We have the one day 12hr. Class, And we offer a 3 night class 4 hours each night for a total of 12 hours. The 3 night class typically start at 6pm each night. You will need to bring your Ohio Drivers license, or another State issued ID. Ear protection, Eye protection, Ink pen, A safe shooting handgun 100 rounds of ammo for your gun. If you do not Have a handgun Please let us know. We will let you use one of our .22lr handguns for the class. The cost of our class is $120.00. This includes Professional instruction by an NRA Certifies Instructor, NRA basic shooting course materials, Ohio Attorney General Concealed Carry Handbook and License Application. Lunch is included in the cost of the class. 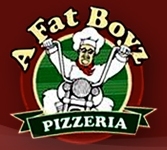 We are proud to Have partnered with A Fat Boyz Pizzeria of Troy, Ohio. To Register, Go to this Link www.2ndamendmentstuff.com/Ohio-CCW-NRA-Basic-Pistol-Ohio-CCW-Basic-pistol.htm Pick a date and check out. If you do not see a date that works for you, and/or have a group of 8-12 people who would like to take the class together, Please contact us directly. We will be happy to schedule a Private class for you. This CCW class is held in Tipp city, Ohio conveniently located only 20 minutes north of Dayton, Ohio. Our Classroom is only 4 minutes from I-75 exit 68 at 3 G Tactical, Our Private Outdoor Range is only 4 minutes from I-75 exit 69 at 2nd Amendment Stuff. We take training seriously and so should you. If you are contemplating carrying a concealed handgun for your self-defense this is the class you need to take. 3 G tactical is Mimi Counties only Class 3 NFA dealer. Come check out the shop, and get some real training. Even if you do not plan to apply for an Ohio license to Carry a Concealed Handgun, This is a great course to learn basic firearms safety, and basic pistol shooting skills. Our course is based on the NRA Basic Pistol shooting course. these Ohio Concealed Carry Classes (Ohio CCW) are filling up. Register soon to secure your spot. This event is a MUST attend. Please visit the link below, and register to come shoot. Have some fun, and help raise money to FIGHT Breast cancer. What: The first annual Aiming for a Cure event is being held as part of What a Girl Wants to raise money to fight breast cancer. ALL PROCEEDS from the event will benefit the Pink Ribbon Girls and Hospice of Dayton through the Belinda Prewitt Memorial Fund. The event will include a rifle competition as well as an after party with live music and refreshments (food and beverage sales benefit the VFW Post). This day is dedicated to raising money to fight and awareness of a disease that has touched so many in a way that is safe and fun. 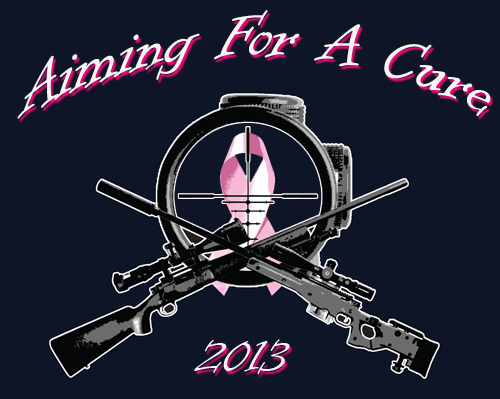 The first annual Aiming for a Cure event is being held as part of What a Girl Wants to raise money to fight breast cancer. ALL PROCEEDS from the event will benefit the Pink Ribbon Girls and Hospice of Dayton through the Belinda Prewitt Memorial Fund. The event will include a rifle competition as well as an after party with live music and refreshments (food and beverage sales benefit the VFW Post). This day is dedicated to raising money to fight and awareness of a disease that has touched so many in a way that is safe and fun. SHOOTING: 100 yard rifle competition. The competition is freestyle from the line. This means that there will be no bench resting of the guns (no shooting off of sandbags, rifle bags, etc.). Firearms equipped with bipods and/or monopods are allowed. The targets will be standard 100 yard rifle targets. Shooters will fire five shots per target with standard scoring being applied (center of the hole will dictate the score for each round). The number of “X’s” will be used for tie-breakers. There will be a “junior” division for shooters 17 years of age and younger. Shooters can register below. lose track of the target. The target is defeating breast cancer. We will continue to fight for those who have gone before us as well as those who are in the fight at the present. The Belinda Prewitt Memorial Fund was established to create, promote and conduct special events supporting programs dealing with various stages of breast cancer in an effort to raise awareness and reduce the stigma of breast cancer through education on symptoms, treatment and support. Belinda, or as she was affectionately known to many; “Buffy” was from Tipp City, Ohio and died June 11, 2012 at Hospice of Dayton after a long battle against breast cancer. She was born on Little Rock Air Force Base April 19, 1967 to John and Diane Prewitt. She graduated from Tippecanoe High School in 1985 and became Interactive Account Director for Berry Network where she was employed for over 20 years. Belinda was a breast cancer survivor who was selfless in her crusade to promote breast cancer awareness putting all others ahead of herself. She was a beautiful, strong and independent woman with a generous heart. She had a smile that was contagious with an onery laugh that brought happiness to all. She had a deep passion for animals, the beach, flowers and most importantly fun. Even in the darkest times, nothing could ever dampen her spirit. She taught us that life is short and we have to “Live Like We’re Dying”. Belinda was, is and always will be the driving force behind 3G Tactical’s commitment to raising funds and awareness for the breast cancer cause. 1. Comfort – no surprise here…., but I don’t want excessive movement of the holster on my belt or against by body. Firm but adjustable is what I like. For example, when I like to make a small adjustment getting in and out of my truck. 2. Durability – I don’t want to spend $$$ on something that goes on the top shelf or into the trash can after a couple years of use. It is very easy to end up with as much $$ in holsters and accessories as it is the gun that they’re matched too. 3. Functionality – Simple, is it made for my gun and do I need to compromise anything to make the system operate fully. In other words, even though the package shows my model of weapon on the packaging, will I have to “accept” some sort of short coming and/or modification that I need to make to improve the overall system. 4. Minimal Weapon Wear – I expect some wear, physics says its going to happen. Personally, i view my carry weapon as a “working weapon” so it will never go onto any trophy mantle. At the same time I don’t want a $600 weapon looking like a kids toy with the plating coming off after only a few months of use either. 5. Something I call “Combat Ready Retention” – This covers quite a bit…. I expect the weapon retention of the holster to be perfect if I’m on my JD Gator, 4 wheeler, running with my grandson, stacking wood, or ready to dispatch some jackass trying to come into my home. I cant be ready for the combat (CQC) situation if I have no confidence that my holster will get me and my weapon to that moment or situation. 6. Appearance – while I don’t need the holster to make a fashion statement, I don’t want it to look like my two and a half year old grandson made it either. However, I firmly believe in function over fashion. Comfort – This holster is comfortable! I am still carrying a G19 and what I thought would be a problem due to the lack of realestate when compared to the “tuck it” turned out to be of no concern. 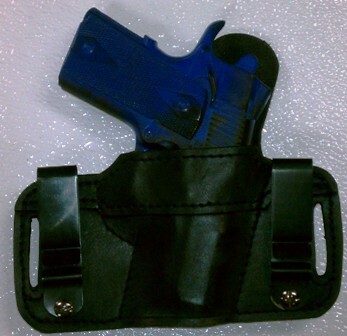 For a small holster and mid to standard size weapon this holster is very comfortable. I have done long driving trips, duty station work, splitting wood, mowing, working, you name it… I have never had the thought “I cant wait to get this holster off of my side” go through my mind. My inside layer of clothing or undershirt doesn’t seem to get “walked up” even when the outside shirt is tucked in. Overall movement is limited and if I need or want to move the holster from the 4 o’clock to the 4:30 position or vice versa there is no issue whatsoever. Durability – Again, your quality of materials is great. I have sweat to death in this holster, been sprayed with a hose, traveled to places and froze my @ss off and the leather and reinforced lip have maintained its shape with no issues at all. Ride height seems to be perfect for me regardless of jeans or shorts worn, I have had no issue regarding ride height and the cant is perfect. The cant seems a little less than 15 degrees, maybe its more like 13? Trade secret I’m sure, but its perfect. Functionality – Following what I did prior I offered a score on the “tuck it” holster and I will do the same here…. I would give this holster a 99% functionality right out of the package! I love the holster the way it is, including the clips. I think that the clips should stay swivel and not fixed. When compared to the “tuck it” I said that fixed clips would be better for the holster (as I showed in my modifications) this O.H.I.O. needs NO CHANGE TO THE CLIPS. With the small realestate the additional slight movement that occurs allows the holster and weapon to move with my body and whatever activity that I am doing at the time. Minimal Weapon Wear – Nothing to complain about here… only leather touching the weapon,… I cant see any wear issues occurring at all. So, someone that carries their “pretty” weapon instead of their “working” weapon will have no issues at all. Combat Ready Retention – The weapon stays in the holster very well, just the natural tackiness of a good grained leather. I have never had the weapon “sneak” up, even after a run or some tree climbing to top a tree. Appearance – Same as last review, I am not in this for fashion… However, a good looking holster sells when on the shelf. This holster has the appearance that I would expect and I like it very much. It has that manly well built appeal to it. Wrapping up, this is the only holster that I wear, ask my wife! The only time that I haven’t worn it has been the far and few times that I have ankle carried. I think you have put one in the bulls-eye with this holster and I hope you sell a pile of them so other people can enjoy this holster as much as I do. Your materials, design and efforts have shown through in this holster. Even with everything that I have done with this holster you could still put it on the shelf and sell it as new. Matter of fact the only issue that I see is the fact that once someone buys this holster they wont need to buy a replacement for a very long time! Thanks RJ from Ohio for this great review.